A West Yorkshire recycling company has proved a “cash cow” with a difference after an unusual donation to one of the county’s biggest hospices. 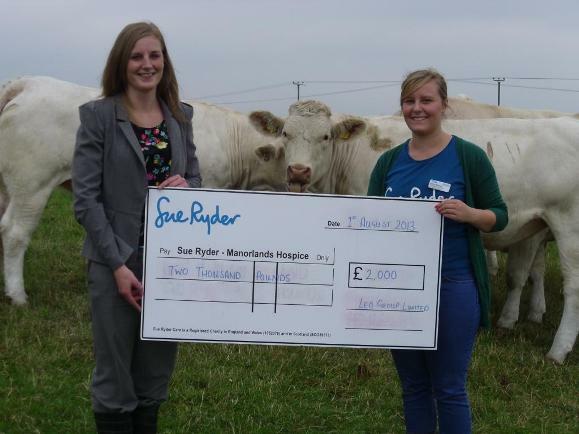 The Leo Group donated cattle to the Sue Ryder Manorlands Hospice, near Keighley – milking a grand total of £2,000 for the charity when they came under the hammer at auction. The donation will be used to extend charity’s counselling and support programme for children who have lost a loved one. The company, based at Thornton in Bradford, and Swalesmoor in Calderdale, is at the forefront of the UK’s recycling and renewable energy sectors, but also has strong links with agriculture raising more than 400 head of cattle a year – both pedigree and commercial – at its farms across the country. It has long been a major supporter of the hospice – part of its £125,000 programme of charitable donations in 2012/13 – and is a sponsor of one of its biggest fund-raisers of the year, the Mascot Gold Cup run at Wetherby Racecourse. It is the company’s farming operations which equip itwith the knowledge to understand the entire supply chain from start to finish – from raising the cattle to processing the by-products. Ultimately, there is no waste throughout the entire process. “We all know someone whose lives have been touched by the amazing work of the Sue Ryder Manorlands Hospice. “By donating the proceeds from the auction of our cattle, we hope it will add an extra dimension to its work at the heart of the community. Over the years, the Leo Group has built a reputation for breeding quality cattle year on year. This is proven by prizes won at shows and sales throughout the country. Sue Ryder Manorlands Hospice is based at Oxenhope and offers specialist end-of-life care and treatment at home, or in the hospice, for people and their families who are suffering from serious illnesses.